Starting from Summer ’17, Salesforce allows support agents working in the Service Console to see information about which articles and cases customers have accessed. It’s always useful to know whether customers have seen all the relevant documentation and filed a case before contacting support. With this information to hand, support agents can improve the support they offer and, therefore, increase customer satisfaction. For example, your support agent will not suggest articles a customer has already seen, and will not open a duplicate case. 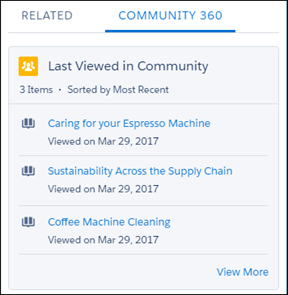 To enable Community 360, contact Salesforce and enable the feature in the communities where you want to gather info. Your support agent will also need profile permission. Use Lightning App Builder to set up Community 360 by simply dragging and dropping the Community 360 component on any case or contact page layout. With Community 360, your support service will become even more efficient.